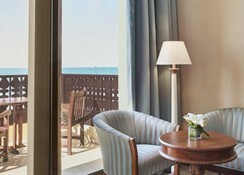 The Al Hamra Fort Hotel and Beach Resort is located along stunning white washed beachs of Ras al Khaimah surrounded by beautiful landscaped gardens and swimming pools.Deluxe guest rooms are also available in elegant style ,accommodating two adults plus one child or maximum three adults with large balconies offering a sea view.Villa Garden Rooms are individually styled traditional Arabian village rooms with wind towers. Rooms have an in-room safe, comfortable sitting area and large balconies offering a garden view.Honeymoon Suite, Diplomatic Suite, Ambassador Suite and Royal Suite available for special occasion or VIP guests.The Restaurants located adjacent to the Convention Center in the Al Hamra Fort Hotel offer perfect alternative venues for lunches,dinners,corporate celebrations and private events with a wide variety of tastes and flavors. The modern rooms have free Wi-Fi, flat-screens and minifridges, plus tea and coffeemakers. 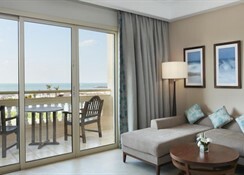 Upgraded rooms add balconies with garden or Gulf views. Suites offer separate living/dining areas; some come with rooftop terraces. Room service is on offer. Breakfast is available (fee). There are 8 restaurants and bars, including a Lebanese restaurant, an English pub and a tropical cocktail lounge. Other perks include a private beach, 2 outdoor pools and a gym, plus tennis courts, a spa and mini-golf. Set in Al Hamra Village overlooking the Gulf, this elegant resort is a 12-minute walk from Al Hamra Golf Club and 10 km from Al Hamra Marina & Yacht Club. Al Jazeera Restaurant is closed until further notice.